As an educator, you are in the unique position to identify, help and support these struggling students. 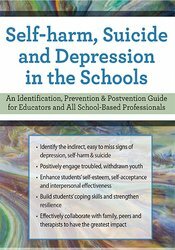 This recording will examine the best strategies for identification, prevention and postvention among students with depression, self-harm and suicidal ideation. Emphasis will be placed on understanding how to detect and respond to at-risk students at the individual level, classroom level and school-wide level. You will learn strategies, techniques and interventions to provide the appropriate support and effectively help students cope. Whether you are a classroom teacher, school counselor/psychologist/social worker, administrator or support staff, you will complete this recording armed with tools you need to connect with and help students who most need your help. Nurses completing these self-study materials will earn 6.3 contact hours. Expires: 12/11/2021.